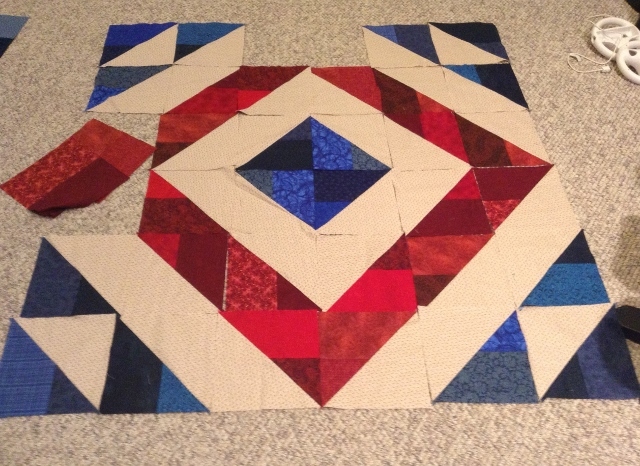 Our guild swapped Blue and Red 10" squares about 2 months ago. These will lend themselves to making a great Quilt of Valor quilt. The medallion style quilt found on Moda Bake Shop by Andrea Harris is called Avignon Picnic. It utilizes jelly rolls for a quilt classified as "easy". Here is how to convert the pattern into 10" squares. Here are my blue choices. Layer up 2-10" squares and sew on both sides. I paired up blues with blues. Cut the units apart and press seams to 1 side. Trim unit to 9 1/2" square. 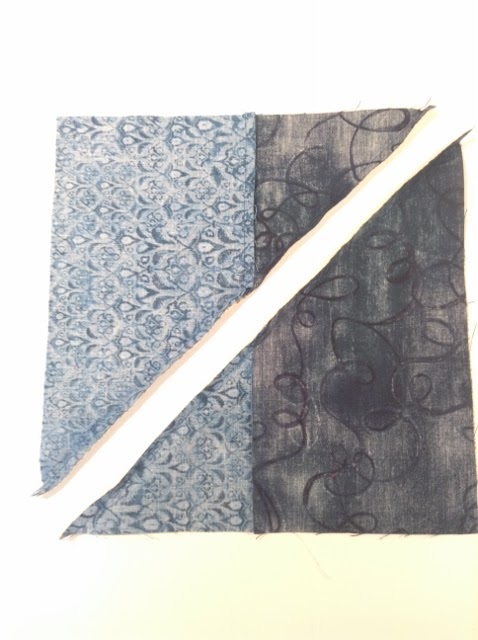 Place background and blue unit that are 9 1/2" square, right sides together. Cut apart on the diagonal. Sew the diagonal seam. Press to the dark. Arrange in a pleasing manor. You can see my plan. These are very versatile blocks. Any of the log cabin or half square designs can be achieved. Bonnie Hunter of Quiltville.com has shown numerous different layouts. Her blocks measure 6" these more in the 9" arena. I will post more about this quilt as it gets closer. Problems: Only 1 background fabric used.....Not enough to make those last blocks. First option is to go shopping to see if any is left. Here is the previous quilt finished with the medallion style layout in the Avignon Picnic Quilt. The quilt below has an inner border that is 2 1/2" around the center unit. The next border is more 2 1/2" strips. The strips alternate 2 1/2" by 6" and 2 1/2" x 4" with a background 2 1/2" square. Check out what is going on over at Freemotion by the River's Linky Tuesday. Connie always has a great response with so much to check out just down river. I am hoping to turn over a new leaf for 2016. This blog has taken a back seat to life. This isn't always a bad thing, but I am hoping to spur on some quilt finishes this year. The design wall is full of possibilities. Goal for this quilt: to be finished by the first Tuesday of February. That is our quilt guild meeting. Most of it is done. It won't take long to finish up. I am hoping to get it on the long arm soon. It is based on an idea from the web. Possibly Angel Pingel's Cut to Pieces. I love her book "A Quilter's Mixology". It "seams" like I came across a cool quilt from somewhere on her site, maybe pictures from a class. That was my inspiration for this quilt. Our guild swapped 5" square pastel/light batiks in 2015. This quilt just goes together great using these 5" squares as the main area of the quilt. The leafs let me use the Accuquilt Drunkards Path Dye. The design wall is a little small for the current size. Stop back and let's see if I can hit that deadline. I am imagining a small dark border surrounded by another round of light squares. Opinions please. I am linking up with Judy L. "The Patchwork Times"-Design Wall Monday. Go see what others are up too.